Have you ever felt the desire to immerse yourself in nature? To unplug for a while and hear nothing but birds and see nothing but forests and lakes? 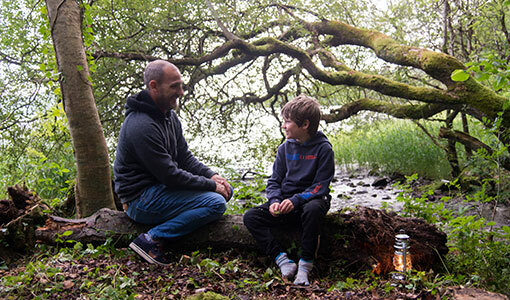 Our Woodland Wilderness Camping trips are run over a weekend (two days and one night) and take place on a private woodland on the shores of Lough Gill. These fully guided trips are designed for first time campers and experienced adventurers alike. Our woodland is a tranquil area where hazel and oak trees grow beside your tent and you can relax in your hammock and enjoy a view of the lake or read a book whilst the sun sets and the campfire crackles. Our tented campsite is low key and blends into nature perfectly, we go to great lengths to reduce our footprint on the environment and we are proud advocates of the Leave No Trace code of outdoor ethics. Although you are camping in an unspoiled wilderness environment we have implemented some of life’s little luxuries to the experience like warm showers, great food and a comfy nights rest. Our campsites are generously spread amongst the trees to allow for privacy and peace and quiet throughout the group. All of the camping equipment you will need is supplied by us and all you have to bring is your own sleeping bag, clothes and other personal items. In the evening we will gather around our woodfired pizza oven and make delicious pizzas. You can choose from a variety of toppings and specialities like buffalo mozzarella or wild garlic pesto picked from the woodland. Your guide Barry is a qualified Leave No Trace trainer and will explain and encourage you during the trip on various ways in which you can reduce your footprint and have less of an impact on the environment as you travel through it. Leave No Trace is a set of outdoor ethics promoting conservation of the outdoors, it exists to educate people about their recreational impact on nature and how to minimize such impacts. What time does the Woodland Wilderness Camping trip start? We will meet at 10am on Saturday morning and begin to pack our kayaks before heading out for the night. We aim to be back again on Sunday at 15:00. We leave from Sligo Kayak Tours HQ - (map link) where you can leave your vehicles securely locked for the night. How long does it take to reach the Woodland Campsite? We aim to be there by 16:00 on Saturday. We will stop for lunch half way so the journey is broken up into two stages. It’s a longer paddle than our normal tours but still easily within reach of a first time kayaker, our pace is easy and it’s all about taking in the scenery and enjoying yourself over the two days. A moderate fitness level is needed. How and what do I pack? All your gear for the trip will need to fit into your kayak. We will spend time packing on Saturday morning and organising gear into the various holds in the kayak. You will need to pack your gear from your suitcase/backpack/vehicle into drybags and then into your kayak. We will supply dry bags for you to use. Bring along two or three full changes of clothes, headtorch, comfy camp shoes, rain jacket, sleeping bag, swimming gear, toiletries, snacks, medication. Included in the price is a packed lunch on day one and delicious wood fired pizzas that evening. On day two we will provide a healthy breakfast the next morning and lunch that afternoon. What if it rains / the weather is bad? 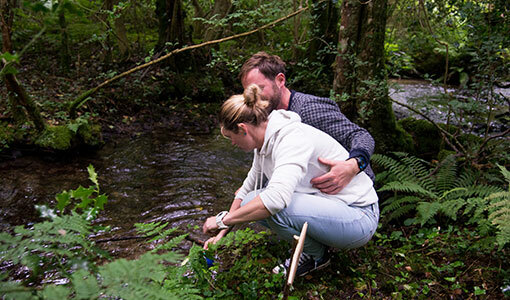 We aim to run our tours in all but the worst of weather as the essence of getting away to nature is all about immersing ourselves in the elements. Saying that we take safety as a primary concern and in situations with high winds forecast for the whole weekend we will arrange a taxi drop off to the woodland and will either run two shorter day tours from there or paddle back on Sunday from the campsite to our cars at HQ. We are able to have a solid grasp on the weather forecast a few days before the tour and will inform you of the plan as soon as we can. Due to the nature of this tour we can only accept people over the age of 16. We provide all your kayaking equipment including drysuits and drybags, and on the camping side of things we provide spacious four person Tipis, inflatable ground mats, pillows, crockery, cutlery, mugs, bowls, plates etc. What is the minimum number of people needed to run a Woodland Wilderness Camping Tour? The minimum number of people needed is 4 people, we cap the numbers at 12 so we can limit our impact on the land and ensure a quality experience on the tour. 10:00 - Arrive at Sligo Kayak Tours HQ and meet the group, pack kayaks and safety brief before getting on the water. 13:00 - Stop for lunch in one of the many forests or islands en route, take a stroll and learn about your surroundings and the interesting history of the area. 16:00 - Arrive at Woodland Campsite and set up your tent, relax and read a book, go for a swim or lie in a hammock and float above the lake. 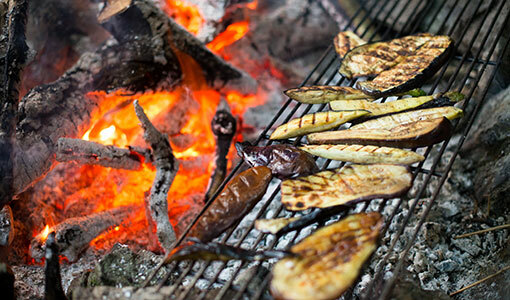 19:00 - Woodfired pizzas in our special pizza oven, design your own pizza and dine under the forest canopy with the group. Spend the rest of the evening chatting around the campfire, and relaxing in a pristine environment. 8:30 - Enjoy a healthy breakfast in the forest followed by breaking camp and packing your kayak for the return journey. 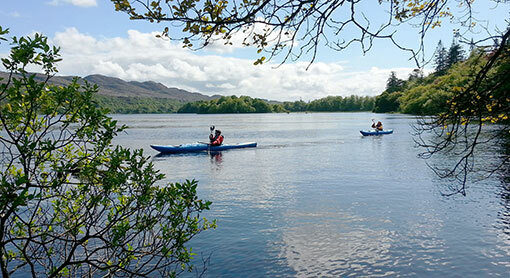 10:00 - Kayak to a nearby island or woodland for a walk around and to hear about the interesting history of the area. 13:00 - Take a stroll around beautiful Beezies Island and enjoy a delicious lunch looking out over Benbulben mountain, Beezies Cottage and the surrounding forests. 14:00 - A short kayak back to Sligo Kayak Tours HQ to unpack the kayaks and say goodbye.